In response to requests from Northern Ireland we are very pleased to be able to represent an excellent 3 piece band based in the Belfast and Co. Antrim area. 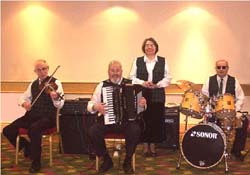 This ceilidh band was formed in 2003 from members of the former Denis Sweeney Band and aim to provide the best in traditional Irish and Scottish dance music for weddings, parties, corporate events, traditional ceili and sets nights, reaching across all cultural boundaries with their Irish/Scottish traditional music and dance entertainment. The band works with their own resident caller for those occasions where people need a little help with the traditional dances of Scotland and Ireland. The band provides a matching mix of catchy Scottish and Irish dance tunes to encourage everyone to "Take the Floor".